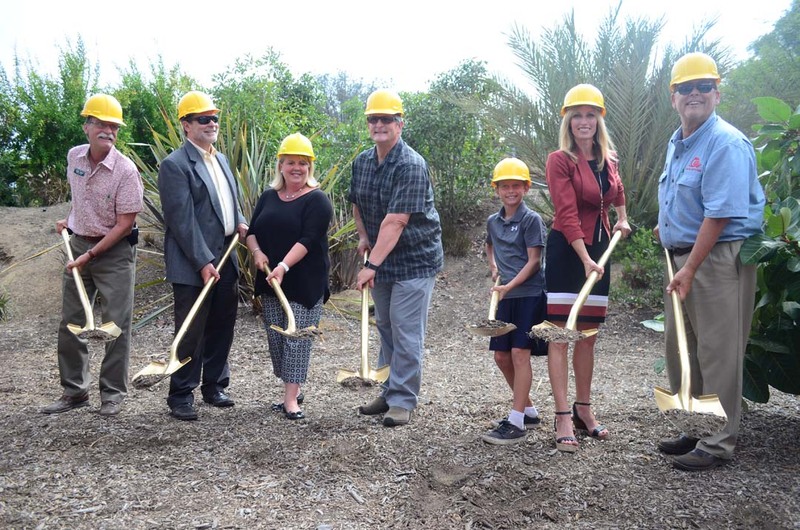 ENCINITAS — “We don’t break ground, we worship ground,” said Julian Duval, president and CEO of the San Diego Botanic Garden just before he and a number of local dignitaries pierced the grounds of the new Dickinson Family Education Conservatory with ceremonial golden shovels. The Aug. 7 groundbreaking brought the project a step closer to the full realization of a new conservatory on the garden site. Still, permits needs to get approved, money needs to be raised and design work needs to happen, but Duval is enthused that they’re making headway. The conservatory footprint was outlined in chalk to give attendees a sense of the scale of the new 7,400-square foot glass structure. At the most recent tally of funds made last week, the project has raised $4.7 million of the $5.3 million needed to complete construction. A brick sale and fundraising campaign is underway to make up the remaining amount. The fact that they’re already 90 percent there in funding, shows great support from the community, Duval explained. And that people are hardwired to be a part of the natural world, Duval explained, is a main reason that support for the project is where it is. The project is in the final stages of receiving a grading permit, according to Rudy Stuber, president of JRS Management and Construction Inc., and project manager. “We’re estimating a year for construction,” Stuber said. One of the reasons for the need of the new conservancy is that the property has outgrown their current meeting space. Duval touted the space as one not just for people, but for plants, too. The conservatory will feature three large hanging chandeliers made of plants, about 18 feet in diameter, and planted wall technology. He compared it to what they did with the Hamilton Children’s Garden, in particular Tony’s Treehouse. “We pushed the envelope on that, and I think that’s likewise to help enthuse donors to believe we’re going to do a good job on this project,” he added. Rebecca Dickinson Welch, of which her family’s foundation, the Donald C. & Elizabeth M. Dickinson Foundation, contributed $1 million to the project, said she was especially pleased that so many people have supported the efforts to bring this project to fruition. 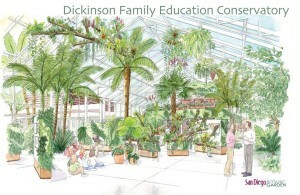 “We think the addition of the conservatory will not only have educational benefits for the community, but also be a positive source of revenue for the botanical garden,” she added. The project has taken several years to get going. 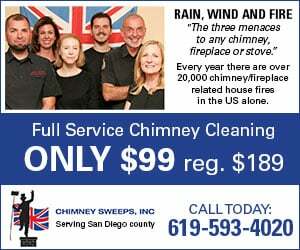 “Who here believes this has been a long time coming,” asked Encinitas Mayor Kristin Gaspar. She recalled a tour of the garden once with Duval, and when they got to the spot of the new conservatory, she said Duval described the future vision of the space. “And when Julian says something, I know it’s going to happen. And when he described it, it was almost as though he described how it exists today, only it’s gotten better,” she said. Duval said they’re shooting for a grand opening of early summer next year. “That little ceremonial shovel in the ground was really not even a tip of the iceberg in terms of what we need to get done,” he said. All of the PA systems will be focused onto the hillside, Duval said. “We’ve done the sound testing on that, so we know it’s going to be OK,” he said. Information on the brick sale fundraiser is available online at sdbgarden.org.